SugarMyBowl.com: A "berry" exciting day! Prepping for the camera can be a bit intimidating when dealing with a script, a teleprompter, wardrobe, make-up, lights, and camera crew. I get nervous easily but thankfully today's work was with my good friend David Grotto. We just wrapped up a series of videos for the California Strawberry Commission and I think we did it successfully well. 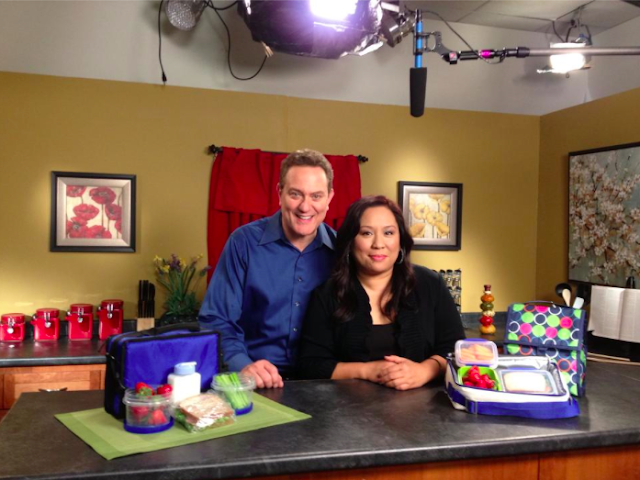 My portion of the video with David was on healthy family eating. I can't wait to see the end result and will of course share it here when it finally comes out. Last week I mentioned how I am involved with this project, so check out that link if you'd like to know more. It was truly a pleasure to be working with David and the California Strawberry Commission again and I hope that you will follow along the many fun things to happen! Also, a quick shout-out to @JustDwana for being supportively awesome and always ready to assist me through it all. That's fantastic MJ!! You look beautiful!! Can't wait to see the series. Thanks, Toni! So sweet of you.